The Philippines has slipped in an annual ranking of how countries are developing their human capital but overall its performance remains above the global average. Manila is among the most stressful cities in the world, according to a new study. THE PESO snapped its week-long rally versus the dollar as it resumed trading yesterday as sentiment towards the United States recovered, and ahead of the release of inflation data which could dictate the next moves of the Federal Reserve. The local stock barometer slightly gained yesterday, staying afloat 8,000, while tracking firmer US stocks overnight. THE P33.469-billion proposed budget of the Autonomous Region in Muslim Mindanao (ARMM) for 2018 was approved late Tuesday by the House of Representatives and is set for committee-level deliberation at the Senate on Monday, Sept. 18. JOURNALISTS covering the police beat including Camp Crame are up in arms in connection with an order purportedly issued by Philippine National Police chief General Ronald dela Rosa instructing all police units and offices to deny the media access to police spot reports. President Duterte yesterday gave Filipino athletes who brought home medals from the 29th Southeast Asian Games in Malaysia cash incentives in elaborate rites in Malacañang. As much as P5.5 trillion in electricity cost savings can be realized over the next 12 years from the proposed energy-efficiency and conservation policy. Philippine telecom operators have improved mobile internet quality, especially in 4G (LTE) services but results in a new crowdsourced survey showed the country was still “well behind” global averages. A newly released study of the Asian Development Bank (ADB) showed the inequality of land-ownership distribution in the Philippines, with only about a third of Filipinos owning the properties they live in and less than 10 percent having an agricultural land of their own, according to the results. The Philippine Competition Commission (PCC), the government’s anti-trust body, is investigating the cement, power, garlic and health industries for possible anti-competitive practices, officials said yesterday. The House of Representatives on Wednesday approved on second reading a measure that aims to protect the rights of the lesbian, gay, bisexual, and transgender (LGBT) community. The government and the World Bank may work together to accelerate the rollout of the Duterte administration’s ambitious infrastructure buildup program over the next five years, the Department of Finance said yesterday. Malacañang said that the House of Representatives’ (HOR) move to give three government agencies a budget of P1,000 each for 2018 is part of the government system’s checks and balances. Businesses in the Philippines are still largely unenthusiastic on the benefits of membership in the Association of Southeast Asian Nations (ASEAN), according to a study by the Philippine Institute for Development Studies (PIDS). 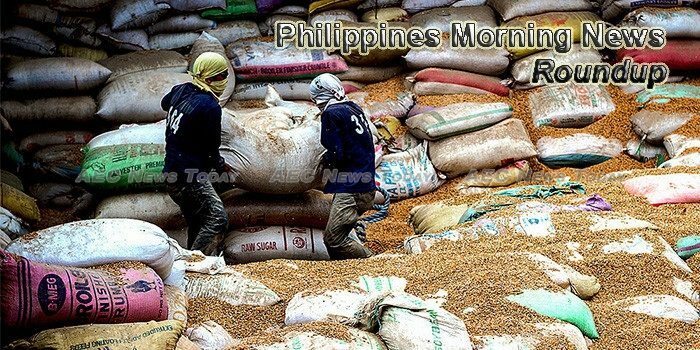 THE National Food Authority (NFA) hopes to time rice imports for early 2018, in order to stabilize inventories after the rainy season, with an eye towards not distorting prices realized by domestic rice farmers. At least eight villages composed of more than 5,000 households will benefit from the ongoing rehabilitation of a farm-to-market road in Rayuray village, Batac City. Term deposit rates rose yesterday, bringing the seven-day term deposits to 3.3484 percent from last week’s 3.3334 percent with accepted rates ranging from 3.235 to 3.4 percent. THE SENATE is planning floor deliberations on Sept. 20 on new revenue measures that will partly compensate for dilutions of the original tax reform program proposed by the Department of Finance (DoF). THE Department of Transportation (DOTr) will return all 48 new light rail coaches procured by the previous administration from Dalian Locomotive and Rolling Stocks Co. for P3.8 billion if a third party qualifier will conclude that the trains are unusable, according to Undersecretary Cesar Chavez. PHINMA Energy Corp. formally filed a case against the Power Sector Assets and Liabilities Management (PSALM) Corp. and its former president, Emmanuel Ledesma Jr. to stop it from terminating an agreement on naming independent power producer administrators (IPPAs) for the Unified Leyte Geothermal Power Plant. The Philippines and Malaysia have discussed various measures to enhance trade and investment relations including regional economic integration. Filinvest Land Inc., expects to generate P20.75 billion from the sale of its multi-tower residential project The Levels it is constructing in the 244-hectare Filinvest City in Alabang. The People’s Republic of China (PRC) will be donating some USD3 million worth of engineering equipment for the proposed rehabilitation and reconstruction of war-torn Marawi City. President Rodrigo Duterte today witnessed the turnover of check worth PHP65 million donated by the Chinese government for soldiers who sustained injuries in the conflict in Marawi City. The Philippine government is set to start the importation of beef from Argentina after three companies from the country received accreditation from the National Meat Inspection Service (NMIS), Agriculture Secretary Emmanuel Piñol said. Senators on Wednesday, September 13, warned of a deadlock should the House of Representatives insist on the measly P1,000 budget for the Commission on Human Rights for 2018, as they vowed to restore the CHR’s full allocation. Behind the five-fold increase in MacroAsia Corp. shares this year is a venture’s expanded jet service and maintenance business. The company is the top performer among the 274 equities listed on the Philippine Stock Exchange, with its market value approaching $300 million. More gains may lie ahead.